Pavel Russinov is a mechanical engineering student from Kohtla-Järve who was among the first participants in a Venture Camp organized in Estonia along the lines of the Riga-Cambridge Venture Camp, where SSE Riga was one of the sponsors. 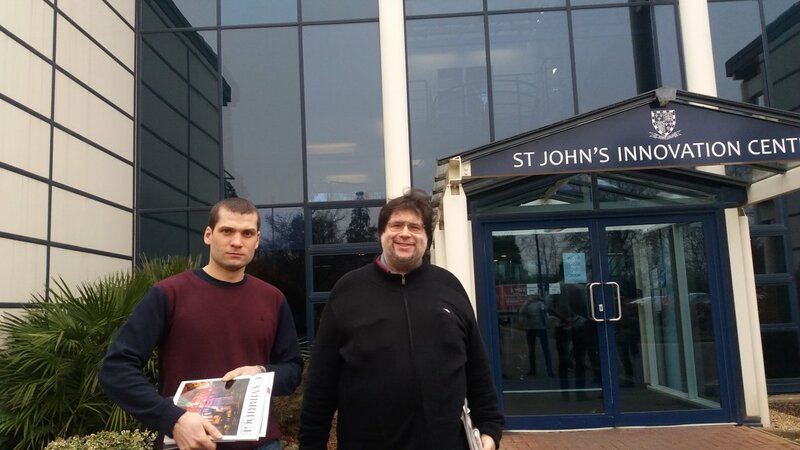 Pavel was selected from among course participants in an informal entrepreneurship education program last year to go on for more training and mentoring at the Anglia Ruskin University in Cambridge, the United Kingdom, in January 2017. “I saw information about the program at my college, the Tallinn Technical University branch in Kohtla-Järve, attended it and won a competition that gave me a chance to go to Cambridge,” Pavel (in the photo in the middle) said. While many young entrepreneurs dream of the next killer smartphone app or a fintech solution that lives in the “cloud”, Pavel’s idea that got him to Cambridge was the down-to-earth, day-to-day stuff also known as…rubbish. While aspiring programmers are working on the next great space fantasy game, someone must take care of all the pizza boxes from their three-day marathon brainstorm as well as get rid of leftovers, bottles, cans and whatever else from the rest of the apartment or office building. Consumer societies – perhaps emerging ones like the Baltics more than others – generate lots of trash which requires a trash collection system with lots of capacity for taking away all the stuff we no longer need. Capacity means handling volume and the less volume our thrown-away waste takes up, the more efficiently the capacity of containers and rubbish removal trucks can be used. This, as Pavel explains, is the basic idea of his ongoing project, a new and better trash compactor for multi-dwelling residential areas. Mechanically compacted trash takes up less space and can be stored and moved more efficiently with fewer trucks needed to take away the same amount of trash – now crushed much smaller – which earlier required more vehicles and workers. Pavel is cautious going into much detail about his project. Trash compacting is not a new idea or new technology, but Pavel’s innovation impressed his instructors at the Tallinn Technical University course and the instructors in Cambridge. In general terms, he says it is a “closed electromechanical and hydraulic system to improve trash collection in housing areas”. He needs to finish work on a prototype, and, as his Cambridge instructors told him – to work on funding so that he can present the prototype and do marketing of the system to target customers. Finishing the prototype needs additional financing, so Pavel explained that he is exploring some new opportunities, such as crowd funding. Currently, he is working with Enterprise Estonia (EAS), which provides various kinds of funding for new enterprise development. So far, he is making a video to promote his trash compacting innovation, and is doing all the marketing himself. If he gets more funding, Pavel hopes to engage someone to do marketing for him. Pavel’s hope is that the trash compacting device could be manufactured in Kohtla-Järve, a city in Estonia with an industrial tradition and a Russian majority population. As in its Baltic neighbor country Latvia, the Russian minority, many of whom arrived during the Soviet era, or are descendants of these arrivals, is the source of some ethnic and political tensions, so the Riga-Cambridge Venture Camp has tried to include entrepreneurs of Russian descent or from outlying regions. The Riga-Cambridge Venture Camp moved to Estonia to offer entrepreneurship training to young entrepreneurs from Kohtla-Järve. It is an informal education program, which takes place in leading universities, business incubators and innovation centers in Riga, Latvia and Cambridge, UK. The Venture Camp in Estonia was held at a branch of the Tallinn Technical University and provided an opportunity for cross-disciplinary students to gain practical insights into the local and global business world from experienced entrepreneurs/lecturers in Riga and Cambridge. The program has been aimed at stimulating enterprise and innovation in the Baltic area’s outlying regions, starting in 2016 with Latgale in the east of the country. The founders of Connect Latvia include the Riga Technical University, the University of Latvia, the Stockholm School of Economics in Riga (SSE Riga), Connect Sweden and the Riga City Council.